The widespread adoption of free software began with the advent of the smartphone and tablet era. Certainly, there was “freeware” and “shareware” before then for desktop computer users, but they were largely targeting “computer geeks” and kids. When Steve Jobs walked out on stage and unveiled the first iPad, complete with a dizzying array of apps, a shockwave was heard around the entire software industry. People now had access to free, high quality “apps”, and with that arose the mentality that software should be free. To demonstrate this point, ask yourself the following questions: How often have you actually “paid” for an app on your iPhone or Android phone? Are you more likely to download an app if it’s free? Would you consider purchasing an app if it was $4.99? Do you consider $4.99 a high priced app? For me, the answers to these questions are as follows: rarely, yes, probably not, and yes. I’ll bet your answers are similar to mine. Here’s a funny thing, though- I have absolutely no problem walking into a nice coffee shop and spending $5 on a large venti-half-caff-skinny-mocha-latté. Even though the drink is over-priced and gone in less than 10 minutes, I don’t give it a second thought. But an app for $4.99? It had better slice bread, do the laundry, and change my life! I recently introduced my graduate students the beloved music software Music Ace - perhaps one of the most successful music education software titles in existence. After showing them the interface and features, I asked them how much they thought it cost. Their answers were not surprising. Most estimated that it cost approximately $10, while others posited that it was less, or even free. When I told them the actual retail price, a little over $100 per CD-ROM, they were stunned. Only a decade ago it was the norm to pay hundreds, if not thousands, of dollars for music classroom software. Today, that is simply not the case, unless the software is purchased for a high-end music technology lab. The vast amounts of free and low-cost software available to teachers is incredible. The paradigm has shifted. In the minds of many music educators, the value of software has evaporated from a cost perspective, but the pedagogical value has remained. Before diving into the various free and low-cost software options that are available, let’s first discuss what free and low-cost actually mean. We’ll break them into two broad categories: Web-Based Software and Locally-Installed Software; and three sub-categories: Forever Free, Freemium, and Low-Cost (under $50). Freemium: Applications posssesing “premium” and “free” versions, of which the free version has limited functionality (saving audio, number of files, locked down features, etc.). This software also requires users to input personal information (email address, name, etc.) to create an account. In the Freemium model, the manufacturer frequently attempts to persuade users to upgrade to the premium version. Low-Cost: Applications that require users to purchase accounts to be able to use them. These applications rarely have a free account option, though they may offer limited demo accounts. There are obvious pros and cons to all of these categories of software, and of course, there are some applications which use hybrid models (web-based and locally installed versions of the software). Teachers should be well informed before adopting any software for use with their students. Below is a quick overview of the pros and cons of each, with examples of software in each category. Good option for "try before you buy"
With this information in mind, let’s take a closer look at the various software available to music educators for classroom use, paying heed to what makes the most sense for individual teaching situations. Perhaps the most popular software category in music education is notation software. It is useful to teachers, and a great way to get students reading, notating, and creating their own music. Before implementation, teachers must first determine the manner in which they will use this software with their students. Will it be used primarily to create teaching content? Will students need to have access to the software in order to complete assignments? If so, would it be preferable for those assignments to be completed inside or outside of the class? What devices will students be working with? How often will it be used? With these answers in mind, teachers can make the best decisions about which software is best suited to their classroom. For example, if the software is to be used primarily by the teacher to create instructional content, one might consider purchasing the full professional versions of notation software, such as Sibelius, Finale, or Dorico. MuseScore is a terrific free option, and many consider it as robust as these professional titles. If students require access to the software, the options instantly change. When I taught middle school, I had a 12-station music technology lab, each equipped with a copy of Sibelius. The advantage to this setup was that my students could do amazing things while they were with me in class, but the minute the bell rang, that access ended. If student access outside of class is preferable, then web-based options are vital. These include Noteflight Learn and Flat. As mentioned previously, both products use the Freemium model, which requires users to enter email addresses for the free versions. 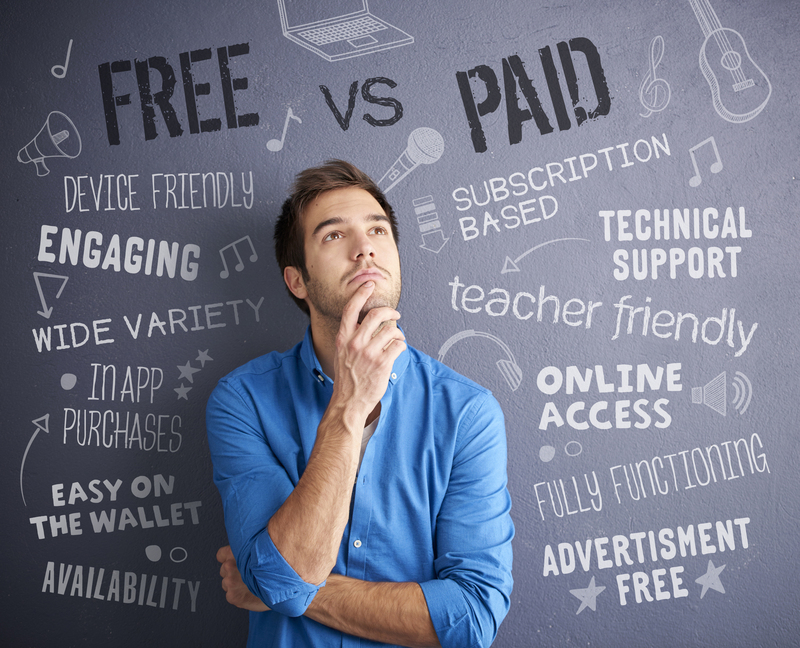 Part 2 of this article will mention the pros and cons of how students can use Freemium software in the classroom- including how they turn their work in to their teachers. The paid versions of both of these titles make that interaction infinitely easier. When it comes to the devices that students will be using to access notation software, there is one major concern to consider: does the device have a hard drive? If the answer is yes, you may consider using MuseScore or Finale Notepad with your students. Both are free, downloadable, and user-friendly. If your students are using devices with no hard drive, such as Chromebooks, iPads, or phones, you should strongly consider web-based apps (or iOS apps for iPads). Finally, if the use of the software is going to be limited- say, only used for a unit of study over a course of a few weeks- it might be preferable for teachers to use the free version of these products, bearing in mind that the experience for the students will be limited, and the long-term archiving of student work will be difficult. One of the most incredible advancements in technology is the ability for software creators to recreate a fully-functional DAW (digital audio workstation) in a web browser. The programming knowledge and level of complexity required to create such software is staggering. There are currently some wonderful software titles available in this category, including Soundtrap, Soundation, BandLab, and GarageBand. As with notation software, teachers need to assess the manner in which they will be using the software in their teaching. As before, if student access is preferable, then web-based software is definitely the route to go. (The sole exception is GarageBand, if students are using iPads or iPhones). Part 2 of this article will discuss the drawbacks of using the free versions of web-based software, but for now we will consider the positives. Students’ ability to work in class on any device, creating music in a DAW environment, is a wonderful way to foster their creativity. Their ability to continue working on their creations outside of class makes web-based DAWs invaluable. After all, students aren’t always at their most creative whilst in their 42-minute music class. Many of them love to create in the wee-hours of the night (when teachers are fast asleep). When inspiration strikes, their ability to open up any web browser and create is nothing short of magical. Soundtrap is unique among the titles mentioned, in that it allows multiple students to collaborate on compositions (with the paid version of the software). Another product in this category, O-Generator, is used primarily by students who “just want to make beats.” It is a loop-based composition tool with some incredible content focused on world music and composition. It is certainly worth a trial if you’ve never heard of it. Over my many years of using GarageBand with my students, I have found that the work they create is often spectacular. Affording them the opportunity for “anytime” access and the option to work collaboratively is something I would have loved to have provided for them. PracticeFirst and SmartMusic both offer web-based, automated performance assessment for students and teachers. Both of these titles offer the ability to automatically assess large numbers of students, and also many other features. As both titles offer free demo access, I suggest that you try both to see which program best suits your needs. The major difference between the two is the available content. There are quite a few other differences which will be covered in Part 2 of this article. Hal Leonard offers a terrific product called Essential Elements Interactive that serves as a supplement to their evergreen method book series. While it doesn’t offer assessment, student access is free and it makes practicing more interactive and fun. An additional software title to consider for performance assessment is the very popular Sight Reading Factory. This software generates unlimited sight reading examples for all music students, including band, string, choir, and piano. You can also generate ensemble sight reading examples, which is sure to enhance students’ sight reading skils. The only drawback to Sight Reading Factory is that it does not automatically assess the student responses- a small price to pay for the power of the composition/sight reading engine. There are many software titles that do things other than notation, music production and performance assessment. Many of these include rich content and assessment focused on a variety of music fundamentals, including music theory, music history, and music concepts. Titles such as Auralia, Musition, MusicTheory.net, and Focus On Sound offer teachers content to use in their classrooms outside of performance-based ensemble scenarios. MusicTheory.net is certainly one of the most popular free resources available, and is a great way to engage all students with music theory. Part 2 of this article will explore the downsides to using these free theory apps, but in many cases the benefits outweigh the drawbacks. Auralia and Musition are fantastic music theory and ear training titles and offer both a limited version (AuraliaFirst and MusitionFirst) for a fraction of the cost. Focus On Sound is an interactive, media-rich encyclopedia of musical instruments and terms, and is a great resource for all facets and levels of music education. Unfortunately, there is no free version of the software, but MusicFirst does offer a free 30-day demo. Most of these resources are perfect for in-class instruction using an interactive whiteboard, but also provide assessments that can be completed by students outside of the classroom with any internet-enabled device. As you can clearly see, there are mountains of software resources at hand for music teachers to use with their students. My strong recommendation is that you try all of them to see what works for you. Don’t be afraid to try them with your students as well. Try opening up incredibox.com for your students using your interactive whiteboard and get them to come up and compose; they will love it Ask your students to use these software titles at home to complete some homework assignments and see how they react. Ask yourself if they were all able to successfully access the assignments. What went right? What went wrong? The benefit of using free and low-cost software with your students is that the investment is small and the rewards can be great.